REVIEW: "25th Annual Putnam County Spelling Bee"
Can You Spell IF U N ? As the spelling bee starts and the young competitors begin their rounds in the opening number of "The 25th Annual Putnam County Spelling Bee" at Lyric Stage Company, they jointly proclaim, it's a "very nice, very nice, very very very nice, very nice beginning." Based on this charming production of the little show with the really big name, the same can be said for the new season at Lyric Stage. The one-act "Bee," conceived by Rebecca Feldman, with music and lyrics by William Finn and a book by Rachel Sheinkin (plus additional material by Jan Reiss), skewers everything nerd-y about spelling bees, while embracing the gentle souls who participate in them. Stephen Terrell directs and choreographs. "Spelling Bee" first came to life in 2004 at Barrington Stage Company in Western Massachusetts. It was so well received that it went on to New York, made its mark off-Broadway at Second Stage and subsequently transferred to Broadway's renowned Circle In The Square, winning a Tony Award along the way. The evening begins before the lights even dim. It turns out our moderator and hostess for the Spelling Bee, one Miss Rona Lisa Peretti (Kerri Jill Garbis), a former champ herself, is chatting up audience members as they file in. Then we're introduced to the motley crew of middle school spellers competing, ranging from Leaf Coneybear, who's possessed by spelling (literally), to Logainne with two gay Dads, Olive with a missing Dad, William Barfee with a magic foot, the over achieving Marcy Park, and Chip, the Boy Scout and returning champ who's eventually sidelined by a moment of yearning. Pre-show, there's a sign-up sheet in the lobby for audience members who'd like to join the fun. And while audience participation can sometimes be downright dreadful, here it was very amusing, due to the show's built-in method of dealing with these outsiders combined with the personalities of the people involved. They were, of course, intentionally eliminated with atrociously difficult words, but it was fun while it lasted. The book of the show is smart and funny. (There are also a couple of timely local references, which we can assume will change with the headlines.) The routine, per round, is that each contestant is given a word to spell. They may (and do) ask for a definition as well as for the word to be used in sentence. Handling this part of the program is Vice Principal Douglas Panch, played with dry, acerbic wit by Will McGarrahan, who once again shows how well he knows his way around a really sharp line. Through it all, Miss Peretti provides color commentary and spews out interesting minutia about the contestants. Keeping order (and fulfilling his court-appointed community service) is De'Lon Grant as Comfort Counselor Mitch Mahoney. The cast, many new to Lyric, fill their roles nicely. (It can sometimes be kind of creepy when adults play kids, but again, not the case here.) They include Lexie Fennell Frare as the lisping, tight-shouldered Logannine (with a Dad who resorts to treachery to try and snag the win), Michael Borges as the sweet, home-schooled and cape-wearing Leaf, Daniel Vito Siefring as outspoken loner William Barfee, Lisa Yuen (from the original Broadway and off-Broadway productions) as over-achiever Marcy, Krista Buccellato as the lost and lonely Olive (who does a lovely job with "The I Love You Song"), and Sam Simank as Chip. Simank is particularly funny when, after being eliminated from the bee, he's reduced to selling snacks during a break in the competition. When his abject disappointment morphs into frustration and anger, most of the candy winds up hurled at the audience. In the end, the show has a lot of heart, which in less competent hands, might come off as overly sweet. At Lyric, it's all very genuine. And in that, I think, lies the secret to the success of this "very funny, very funny, very very very funny, very funny" show. It doesn't mock the earnest and vulnerable students competing for the prize. Rather, it sees them for who they are -- six kids, albeit with their own unusual quirks, who long to both fit in and stand out. Just everybody else. 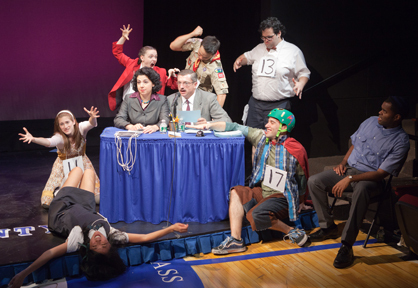 "The 25th Annual Putnam County Spelling Bee" is at Lyric Stage Company of Boston, 140 Clarendon Street, through June 5. For information, call 617-585-5678.